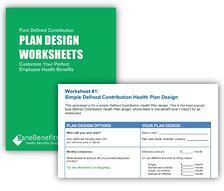 Zane Benefits, the #1 online health benefits solution, announced today the publication of a free guide "Pure Defined Contribution Plan Design Worksheets". The new hands-on guide provides an overview of Defined Contribution Health Plans and includes worksheets to start customizing the perfect employee health benefits. According to Zane Benefits, a Pure Defined Contribution Health Plan is an affordable alternative to an employer-sponsored group health insurance plan. Offering health benefits is vital to recruiting and retaining the best employees. And yet, only 35% of small businesses offer health insurance. The number one reason they don't offer health insurance? Cost. With a Defined Contribution Health Plan, small businesses have controllable and predictable costs, all while offering health benefits that employees love. Because of these advantages, Defined Contribution Health Plans are gaining popularity in the U.S. with small businesses and nonprofits. To help employers get started with designing their perfect employee health benefits, Zane Benefits has made available their most popular Defined Contribution plan design worksheets. The guide is written for small business owners, HR professionals, health insurance brokers, health benefits consultants, and anyone involved in the health benefits decision making process. Zane Benefits, Inc., a software company, helps insurance brokers, accountants, and employers take advantage of new defined contribution health benefits via its proprietary SaaS administration software. Zane Benefits does not sell insurance. Using Zane’s platform, insurance professionals and accountants offer their clients a custom defined contribution plan. Learn more at www.zanebenefits.com.